It was a mixed weekend for Junior Alliance League sides involved in county cup semi-final action. Three Under 12 teams were involved but only one progressed to the final. That was Deeping in the Lincs Cup and they beat Appleby Frodingham 2-0 with a strike by Finlay Adkins-Krijgsman and an own goal. They will play Cleethorpes Town in the final with the date and venue still to be confirmed. 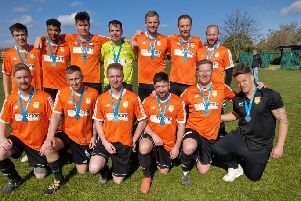 In the Northants Cup there were hopes of an all-Junior Alliance League final as Malborne and Park Farm Pumas Red were drawn apart in the semi-finals. But both just missed out. Malborne were pipped 3-2 at Buckden while Park Farm Pumas lost 3-1 at home to St Ives Black Sox. Luke Rymill got both Malborne goals with Matteo Perkins on target for Pumas. There was also cup semi-final success for Deeping Under 13s Blues. They advanced to the final of the League Cup by beating Division One leaders Baston 4-2 with goals by Finlay Henderson, Harvey Henderson, Jack Brumfield and Shane Bointon.